Hot Water, it's uncomfortable to live without it. Maybe your water heater went out, maybe it's on the way out, or maybe you just want to cut the expenses on your water heating bill. Andrews Plumbing has water heater solutions for those situations and more. Water Heater choices abound! Tankless or Reservoir? Gas, electricity, or geo-thermal? How big should my water heater be? How much do they cost? Andrews Plumbing can help you with your water heater from installation through maintenance and repair. Why is my hot water only lukewarm? Seems like it takes longer for water to heat than it used to. Problems with electric water heaters are usually related to the heating elements, thermostat, cut-off switch, or wiring problems. You can try to reset the High Temperature Cutoff. Sometimes 'flipping that switch' will enable the heating elements to begin heating water again, and your situation just became less critical, for now. But ask yourself, "What tripped the High Temperature Cutoff?". Andrews Plumbing applies a systematic approach to help you properly diagnose the non-working parts to your water heater. Many times a simple repair will have you up and running in short order. Problems with gas water heaters usually come down to one of two issues, the pilot light or the thermocouple. There are instructions permanently fixed to the side of your water heater with the precise sequence required to ignite your water heater's pilot light. If you have tried those instructions without success, give us a call. For your safety, water heater gas valves will only emit gas under exact circumstances. If your pilot light does light, it could be a symptom of a deeper problem such as the pilot light gas line or the main gas valve. The thermocouple allows gas to pass from the gas valve to the burners, IF the pilot light is ignited and IS producing enough heat to light the natural gas. 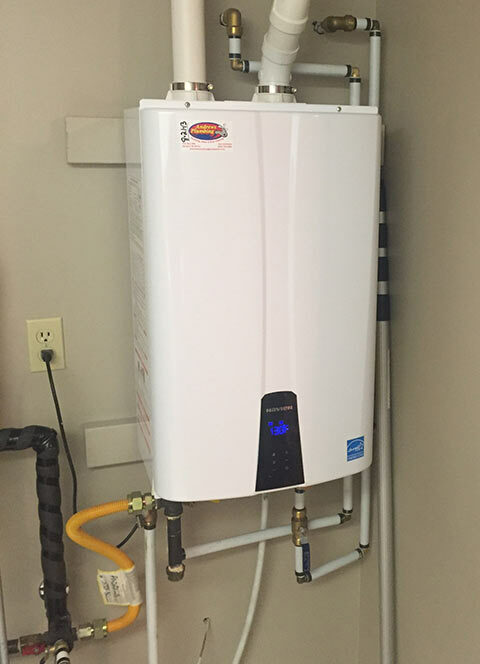 Andrews Plumbing has experience diagnosing and replacing the thermocouple and gas valves of the water heater. The life expectancy of a water heater varies from 10 - 15 years for a traditional storage water heater to 20 or more years for a tank-less or solar water heater. Regularly scheduled maintenance can expand your water heater's life expectancy. Did you know that you should flush 1 quart of water from your water heater every 3 months and check the temperature? If the temperature is down, it may be time to troubleshoot your water heater, before the you have no hot water. The water heater's pressure valve should be checked every six months. The anode rods should be checked annually and replaced as necessary. The harder your water, the more frequently they should be replaced. Solar water heaters require professional maintenance every 3 - 5 years. Andrews Plumbing does provide this service. You have done your maintenance, replaced parts, but your hot water situation is still lacking. It may be time to purchase a new water heater. Water heaters have come a long way since the first storage or tank filled water heater. Andrews Plumbing is familiar with the different types of water heaters, storage or tank, tankless, heat pump, solar, and tankless coil & indirect. Water heaters can be fueled by electricity, natural gas, fuel oil, propane, geothermal, and solar energy. The best way to select a water heater is to purchase the best type that will use the most cost effective fuel. Andrews Plumbing offers a large selection of Energy Star water heaters and can help you compare the cost of the water heater and fuel, based on your water needs, so that you make an informed decision.